The Robinair 17580 makes flushing of lines, evaporators, and condensers fast and easy. Closed Loop — Circulates solvent continuously through components (adapters are needed). Pulsing Action — Loosens dirt, corrosion, and other debris; by switching the hoses, you can also back flush. Air Agitation Needle Valve — Bubbles air into liquid stream to enhance cleaning action. Hose Adapters — Contains adapters to mate with 1/4" flare and 3/8" quick disconnect fitting kits. Sight Glass — To observe flow rates and cleaning process. One gallon of solvent is needed for the flush procedure. The unit purges solvent from the component, collecting the used material in the collection tank. An activated charcoal filter limits emissions and odors during flushing and purging. Make flushing part of your regular A/C service. You know that not all A/C jobs are simple recharges —there are times when you need to flush a vehicle’s air conditioning system to ensure that it operates satisfactorily. These circumstances fall into three categories: Routine Maintenance — As an air conditioning system ages, oil, sludge, and particulates build up, plug screens, expansion valves, and capillary tubes . Periodically, you should flush the system components to remove these contaminants. Repairs — To be sure the system will operate properly, you should flush it whenever you repair or replace components. Failed components may contain metal shavings, sludge, and other debris that damage the system or affect the operation. R-134a Retrofits — In some cases, conversion procedures call for complete removal of existing oil in an A/C system before changing fittings and recharging with R-134a. 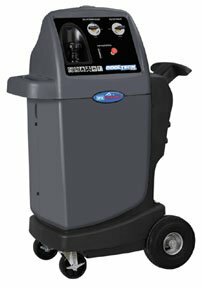 Flushing is the most thorough means of removing the oil, and it will also pick up any refrigerant residue in the system. Flushing, combined with pulling a deep vacuum, is your assurance the system is ready for the new refrigerant.